When I was a youngster, I had a neighborhood friend named Betsy. We lived on a street that had numerous families with kids, great streets for bicycling, and lots of wooded areas to explore. I remember visiting Betsy’s house at least a time or two. However, despite the idyllic memories, the only thing I can recall with any certainty about Betsy is that her father had a silver hook for a hand. I have a distinct memory of studying his hook up close and personal as he showed it to me. It looked shiny, heavy, and sharp. Obviously, I must have been curious and asked him about it—either that, or I stared inappropriately as children are wont to do. I recall him talking to me about it, but I can’t remember anything he said. I only remember being simultaneously fascinated and shocked that such a thing could exist outside of fairytales. Even as I write this, other memories surfaced, such as Betsy’s father using his hook in some everyday fashion, such as holding a newspaper. In retrospect, I’m not sure which intrigued me more—his hook, or how much he’d adapted to it. I hadn’t really thought about that memory of Betsy’s father until recently, after finishing a few steampunk romances featuring characters with prosthetic limbs. I think my early exposure to such a device primed me to respond to them with strong interest when my love affair with genre stories began. I feel strongly attuned to such a story detail even now. 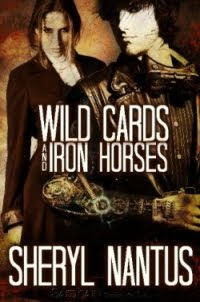 One of the steampunk romances I recently read was WILD CARDS AND IRON HORSES by Sheryl Nantus. The story is set in an alternate universe Old West and features the exploits of hero Jonathan Handleston who is preparing to play the poker game of a lifetime. What sets him apart from other players is that because of a war injury, he has a brace to provide support for his crippled hand. But not just any type of brace. His withered hand is encased by a steampunk exoskeleton! You can bet your sweet bippy that my anticipation spiked when I first learned about it in the story. The big set up is the mystery surrounding how Jonathan’s brace factors into his card playing. And with the stakes of this particular tournament so high, there are those who view his condition with deep distrust. While I probably should have been more excited about Samantha, the genius engineer heroine, it was the hero’s steampunk exoskeleton that really got my heart pumping. Whether fact or fiction, I am in awe of people and characters who have a prosthetic limb. Plus, I want to know more about how it works, what it feels like to have one, and especially what's going on at the point where real flesh meets artificial limb. I simply find the prospect of such an interface both terrifying and cool—is what they mean by morbid curiosity? Another story that rejuvenated my interest in prosthetics was Meljean Brook’s “Here There Be Monsters” from Berkley’s BURNING UP anthology. This steampunk romance launches her Iron Seas series and focuses on the adventures of Ivy—another brilliant engineer!—and her encounters with a treacherous outlaw called Mad Machen. It’s set in an alternate, late Victorian-like setting where the English are still reeling from an infection of steampunk nanoagents perpetrated by an enemy known as the Horde. Ivy has two prosthetic arms and hands that are identical to real arms and hands (except for their color). While they didn’t factor into the story as a plot device, they were a nice worldbuilding detail that lent this heroine an exotic air. In fact, the hero has a prosthetic foot…and then there are the references to other characters with prosthetic limbs. “Here There Be Monsters” was a veritable smorgasbord of steampunk prosthetics. Happy dance! Finally, in George Mann’s THE OSIRIS RITUAL (A Newbury & Hobbes Investigation), one of the secondary characters has a whole body riddled with various steampunk devices and prosthetics. The macabre nature of the character (whose name I won’t mention to avoid spoilers) reminded me yet again why I find historical and/or primitive prosthetics so dangerous and yet endlessly intriguing. Peg legs, wooden teeth, you name it—I can’t get enough of the ways human beings have adapted to the loss of a limb over the centuries. And if such wondrous steampunk prosthetic devices “existed” in the past, what will the fictional future hold?